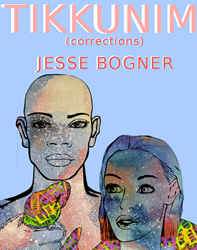 Jesse Bogner, the thirty-year old author of The Egotist, has released a new book called Tikkunim (Corrections), offering a fresh solutions-based style of journalism. The new book offers a fresh solution-based style of journalism, explaining the root cause of the downward spiritual trajectory of society. Today, we are living in an era of mutual discrimination and hatred, and this is no longer a sustainable path. Jesse explains how humanity can fix what appears broken by building a world of new values, by transitioning toward a path of mutual concern and love. Jesse has gone through this challenging transition himself, and he is living proof of everything he is portraying. In 2013, he abandoned a life of self-indulgence in New York, moved to Israel and discovered how the most fulfilling aspect of life is to be genuinely concerned for others through the wisdom of Kabbalah. Today there are many bestsellers by former white supremacists, Islamic extremists, and run of the mill addicts and egoists that have reformed and describe the great hatred they felt toward others. Through his writing Jesse is explaining how due to our escalating egoism, this potential for hate exists in everyone and this revealed hatred is actually the means of finding love. Further proof of this unbridled hatred is most evident in the rise of anti-Semitism worldwide. There is a growing hatred toward the Jews, even in academic circles, and this always transpires before major shifts in our world. Another subject Jesse covers is why he switched to being a Conservative on the day Trump became elected. He conveys how liberals are attempting to hang onto the old system of institutional powers and how this trend mirrors fascism, signaling the slow decay of free speech, innovation and acceptable thinking. What is behind this entire process? It's not about helping the masses with truly beneficial reforms. The appearance of caring for others with faulty social programs has become a front for status quo neoliberal politics that only benefits those with power. For sixty years liberals have made steps of promising a better more egalitarian world we have not seen come to fruition. Civics and equal opportunity have fallen to the wayside. No one benefits. Our world is broken and the time has come to correct it.